With the Bloggie Live, Sony has launched the world’s first Wi-Fi pocket camcorder. We took it for a spin and came back with a mostly favorable impression. This Bloggie, which costs $250, is a fine first effort in the new world of wireless pocket camcorders. Point-and-shoot camcorders are all about convenience, and Wi-Fi promises exactly that, letting you throw your videos and photos online without fussing with USB cables, SD memory cards, or a computer. In large part, the Bloggie Live MHS-TS55 delivers on this promise. This elegant and durable little model, wrapped in a nicely contoured matte silver case, lets you upload images wirelessly to your computer, smartphone, social network site, and even to the cloud, where you can store and retrieve images from anywhere you can hook into Wi-Fi. Wi-Fi newbies will spend a lot of time fiddling around with this Bloggie's menus and settings to get the various Wi-Fi applications to work. However, once you get past the learning curve, this camcorder is generally easy to use, and works as advertised. I tested this Bloggie Live’s Wi-Fi tools at several of my local haunts—a Barnes and Noble store, a Peet’s café, and the Apple Store in Berkeley. I also checked it out at a couple of Starbucks cafés, and with two popular smartphones—an iPhone 4S using the Verizon Wireless network and an Android model, the Samsung Galaxy S II, using T-Mobile’s service. Public Wi-Fi is still a bit wild and woolly. Different access point outlets have different ways to log on to their networks, and it’s not uncommon for a file upload to fail mid-stream. On the other hand, I was often able to upload my Bloggie files at a brisk clip over Wi-Fi. I posted a 13-minute Full HD video file (905MB) to Facebook in as little as seven minutes—10 times faster than doing the same upload from my home computer using a Comcast Xfinity cable internet connection. Many factors impact Wi-Fi performance, including walls and other obstacles that can impede signals, and the density of other wireless traffic in the area. I tested the Bloggie Live in a low-rise suburban area with steady but relatively light Wi-Fi traffic, which likely contributed to my overall smooth experience. Some urbanites may experience more difficulties. I tested three of this camcorder’s four Wi-Fi-based tools: Post and Share (posting images directly to social networking sites); View on Smartphone (copying images directly to a smartphone); and Live Streaming (sending video to family, friends, and colleagues in real-time while shooting). Sony touts its PlayMemories Online cloud service, designed to let you store and retrieve your images from anywhere with Wi-Fi access, but the service was not yet available. Post and Share is the killer app. It let me upload files very quickly to Facebook and YouTube, and is a great option if you want to quickly slap videos and photos up onto the net with little or no accompanying text. 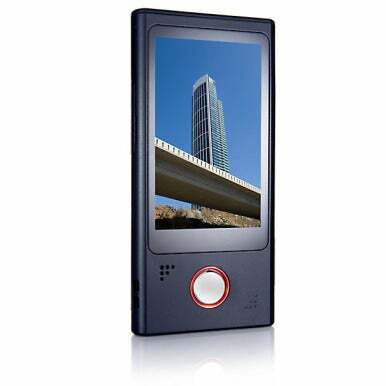 You can add only a brief video title, and even that can take awhile using the camcorder’s cumbersome onscreen keyboard. Once uploaded, you can’t make edits. If you want to change something—such as add a comment or delete an image—you have to work through a device with a browser like your computer or smartphone. As for copying images directly to the smartphones, I had to download Sony’s free PlayMemories Mobile app for both the iPhone 4S and the Android phone. Once I got it going, the apps were very easy to use. Live Streaming is a very cool concept: It lets you turn the Bloggie Live into your own personal video broadcasting system. For example, you can start capturing video of your son’s birthday party, and stream it real-time to family across the country, where they can view it in their browser. In reality, the Live Streaming setup took time to figure out and it didn’t always work smoothly. I had to sign up for a live-streaming service (in this case, qik.com), and sign into the same account from both the camcorder and the smartphone at the same time to get Live Streaming to work. The manual didn’t spell out how to use the online service to do this. When I finally got it going, the video streaming worked well so long as I didn’t move the camcorder much. When I started panning quickly, the streamed video on the smartphone started looking a little jerky. The battery performed well during the Wi-Fi sessions. During one nearly three-hour shoot, I uploaded 9GB of clips—an hour and 45 minutes of Full HD video—and still had juice to spare. In a standard continuous-record run-down test, it lasted two hours and five minutes, about average for camcorders in this class. You get the usual drawbacks, too. 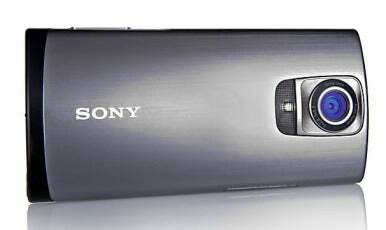 The battery is built-in so you need to send the camcorder to a Sony dealer to replace it. Also, as is the case with most pocket camcorders, recharging takes a long time. It took me three and a half hours to fully recharge off my computer’s USB port. Even if you don’t care about Wi-Fi, the Bloggie Live is one of the better pocket camcorders on the market. Sony made the touchscreen menus exceptionally easy to navigate and added some good touches, such as the ability to shoot photos while recording video, and a short USB cable extender to use with the flip-out USB jack for hard-to-reach ports. Even so, this Bloggie has limitations endemic to point-and-shoots, including slow and easily confused autofocus, relatively poor low-light performance, and digital-only zoom. Measuring 4.5-by-2.2-by-0.6-inches and weighing just 4.8 ounces, this camcorder is as small and light as the iPhone 4S and only slightly thicker. It comes with a gently rounded front panel that rests comfortably in the hand. Still, small pocket camcorders can be a little awkward to handle, and this unit is no exception. It’s too easy to lay a finger over the lens, and I found the unit’s case a bit slick, making me worry about dropping it. Consider using the supplied hand-strap. This camcorder’s sleek look is due in part to minimal manual controls—it comes with only power and still-shot shutter buttons mounted on the right side of the camera, and a large front-mounted button for recording video. It’s good that, for the most part, you can easily navigate the touchscreen menus. Navigating this camcorder’s menus is refreshingly simple—I explored most of the commands in about a half-hour. This Bloggie offers one of the easiest playback menus I’ve used on a pocket model. It includes both video and still-shot thumbnails on the same screen instead of forcing you to jump between two separate locations to see them. You can also display the video start frame and still-shot images full-screen and finger-swipe from side to side to scroll through the images. A convenient drag bar lets you quickly find the place where you want to resume a movie playback. For most commands, the three-inch screen offers the right touch. The limited zoom function—4x digital-only—is typical for candy-bar pocket camcorders. You have to operate it through the touchscreen, but the control works surprisingly smoothly—better than many rocker-switch zooms I’ve used. In only a few cases was the screen either too sensitive or not sensitive enough. I found it easy to accidentally turn on the video light, and easy not to notice it when I’m shooting in full light, wasting precious battery charge. On the other hand, I sometimes had to tap hard several times to select video and photo thumbnails. I found it much easier to view and act on each image full screen and one by one, but I’d rather be able to easily group-select thumbnails. Finally, the menus don’t pivot along with the viewfinder when you rotate the camcorder. When you turn the camcorder onto its side for widescreen shooting, the screen’s display automatically switches to the right orientation, a handy feature you also get on the iPhone 4S. However, the menus stay locked in the upright position. This makes it a bit of a pain to shoot in widescreen because you have to keep rotating the camcorder upright to use the menus, or adapt to using them when they are sideways. These few usability snags are annoying, but not deal-breakers. Like most ultracompacts, the Bloggie Live MHS-TS55 shoots MPEG-4 video and JPEG still images. 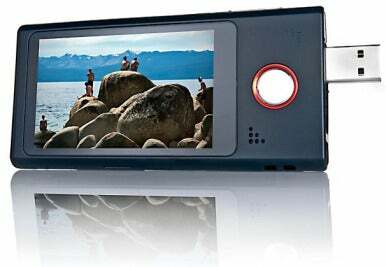 Video and photo quality is quite good by pocket camcorder standards. In full light, the camcorder renders colors faithfully, with none of the oversaturation one often finds on budget models. Even in full light, however, the autofocus pulsed, especially when shooting in 1280-by-720 video resolution. Lower the light even a little bit however, and image color and quality quickly fade and degrade. Shooting just after sunset when there’s still plenty of ambient light, video started heavily blurring as I panned the camcorder, and autofocus often failed to get the right focus. You can easily shoot stills at the same time as you are shooting video. These still shots are limited to the video frame resolution (1920-by-1080 or 1280-by-720), and so they max out at 2MP, much lower resolutions than shooting only still images. On the other hand, this feature makes it easy to save out sample frames from your video stream, instead of having to extract them later in your video editor. The camcorder restricts video files to 2GB in size, limiting Full HD video clips to 25 to 30 minutes each. The Bloggie Live comes with a bright LED video light so you can shoot in total darkness, but it works well only for very tight shots, and only several inches to two feet from the subject. You can move your files off the camcorder without Wi-Fi, thanks to the flip-out USB plug. It was a cinch to plug it into my Macbook Pro and import videos into iMovie and pictures into iPhoto. 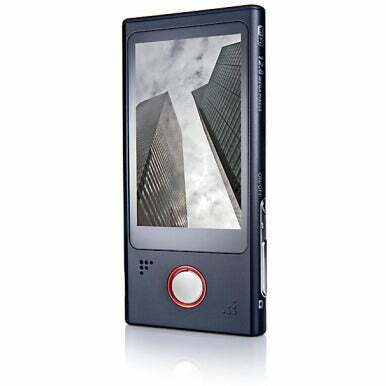 This pocket model lacks a memory card slot, and comes with a somewhat limited 8GB (7GB accessible) of internal memory, storing only 75 to 90 minutes of Full HD video. That’s fine for casual users, but if you shoot a lot of video at that high resolution, you may find yourself spending a lot of time offloading clips. The unit also comes with a miniHDMI port which lets you pipe your video to a TV for large-screen viewing. Bloggie Live or your smartphone? These days, folks who own an iPhone 4S or one of the Android smartphones may feel like they already have all the wireless pocket camcorder they'll ever need. After all, the iPhone 4S lets you shoot Full HD video, and choose between Wi-Fi and your cellular data network. Smartphones also generally offer more to enhance your video experience, such as larger displays, more memory, and Web browsers so you can enter your social networking site and edit your posts. But Bloggie Live offers features most smartphones don’t, such as a video light for low-light shooting and high resolution (12.8MP) still shots. Sony’s $250 Bloggie Live MHS-TS55 is an expensive choice, but a good one—and so far the only one if you’re looking for a Wi-Fi-enabled pocket camcorder. It does a fine job of letting you shoot and quickly post videos and photos directly to the Web, but if you own an iPhone 4S or Android smartphone, you can already do that. If you don’t need Wi-Fi, consider the Bloggie Touch MHS-TS20/S, which sells for $130, a little more than half the price.